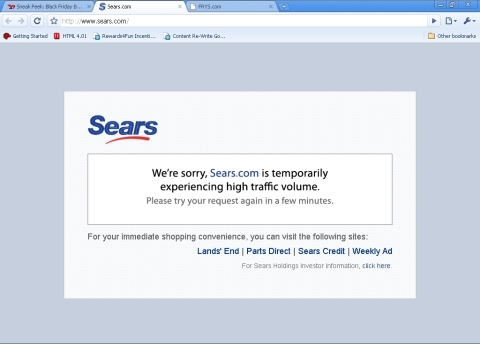 For those of you that haven’t heard, Sears had a bit of a problem during one of the busiest shopping days of the year. I personally found out about it because I was actually planning on buying something from their online store. I didn’t feel like being shot at or trampled to death in the mob of shoppers, so I jumped online where I do most of my shopping. Anyway, this is what I saw. Not exactly the site you want to be showing your customers. How much money they lost because of this is beyond me, but oh well, I don’t own Sears the company or any of Sears’ stock…so I’m golden. There’s been a couple of posts about this already. There was a small tidbit on Valleywag and Marketing Shift, but nothing in depth. I personally wanted to put together a piece that would help Sears and the many other large corporations who’ll probably have the same exact problem in years to come, to actually make moves in preventing it from happening to begin with. I know it’s a lot to expect from these big wigs, but it might help the smaller shops that are a little more agile and can move quicker at getting things done. Loss of MUCHO DINERO!!! That’s an obvious one. 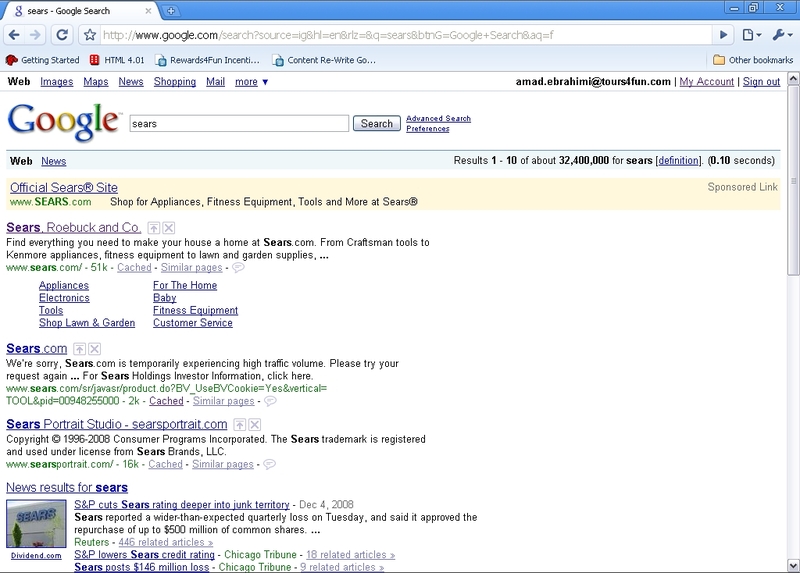 Possible caching of 404 error page in search engines. Not so obvious. Loss of reputation. Someone like myself might cut Sears a little slack, because I know that these things happen, but that 21-year old Digg power user who’s pissed cuz he couldn’t buy his Nintendo Wii is going to flame the sh*t out of you…everywhere! Loss of job(s). Managers, IT guys and Web guys…you’re all fired!! I think that about covers it. Now let’s see how we save ourselves from all the madness. It seriously only takes one person within the company who has even a tiny amount of influence and courage to get everyone on the same page, which leads me to my next point. Somebody needs to step up to the plate to make this a priority. Don’t be afraid, open your mouth, keep telling whomever you can that the company needs to be more prepared for handling heavy traffic during the holidays. Constant nagging has a way of getting others to move out of their complacency, just so they can get that guy to shut up. Chances are “that guy” will be the president of the company someday. Hardware issues probably won’t even be touched until effective communication has been established by a viable leader within the company. After that, I’m sure the IT department knows what needs to be upgraded. Get it done!! If I was “that guy,” I would find all the email addresses of the most influential people within the company (maybe even the CEO), and I’d dump them into a website uptime monitoring service. That way when Bill Crowley is watching the New England Patriots play football on black friday, he can conveniently receive a text message that Sears.com is losing millions and millions of dollars. This is just a guess, but the problem might get some more attention.